BigKev with his new favourite! The best way to end the week and kick off the weekend, is quick blast to Rottnest to catch the sunset. Well lets just say that was a great side-effect. Having recently earned ($$) his twin endorsement, BigKev was keen to get some twin time to brush up and keep his newly acquired skills sharp. Along for the ride, BigKev had three of us in the back and Wash alongside him as his co-pilot. We’d have liked to have gotten away a little quicker, but she required some fuel and the Wash was running a little late. Anyway, it didn’t matter, before we knew it we were getting the full length treatment down runway 06L at Jandakot. Having not been in a twin for a very long time, the obvious big difference was the rate of acceleration and the rapid nature in which the airspeed indicator rose. Even with the 5 burly blokes, it was rather impressive. However the impressiveness of this machine didn’t end with the take-off role. While climbing out, we accelerated through 100, then 110, then 120 knots all by the time we hit 1000 feet on our cross-wind departure. 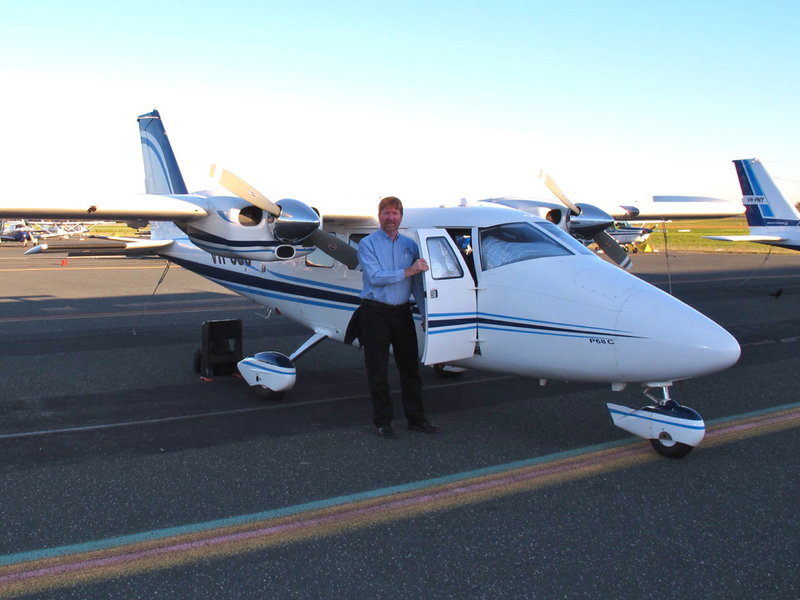 No sooner had we levelled off, we were blasting out over Fremantle harbour with the air speed nudging 160 knots. With Perth Radar giving the all clear to no other traffic, we “ascended” another 1500 feet. I couldn’t use the typical phrase “climb”, because this thing didn’t climb, it ascended! While the boys up front were dazzled by the digital cockpit and slowly shifting their focus to the rapidly approaching Rottnest runway, the rest of us sat back and took in the spectacular views. There is something magical about the sun setting and the colours it projects. We were in for a treat too, the sun was creating some amazing reflections, whether that be from the engine spinner or the large golden mirror lake at Rottnest, spectacular! Attention soon turned to BigKev’s ability to grease this twin onto the runway. The sledging was at an all time high, even the Australian Cricket Team could have learnt a thing or two. Expectations were high and BigKev was even starting to doubt himself. “Well, you’ve all put the mocha on me now”, the excuses were coming thick and fast, as was the approaching threshold. However, it was BigKev that had the last laugh greasing her down with a gentle finesse on his yoke. 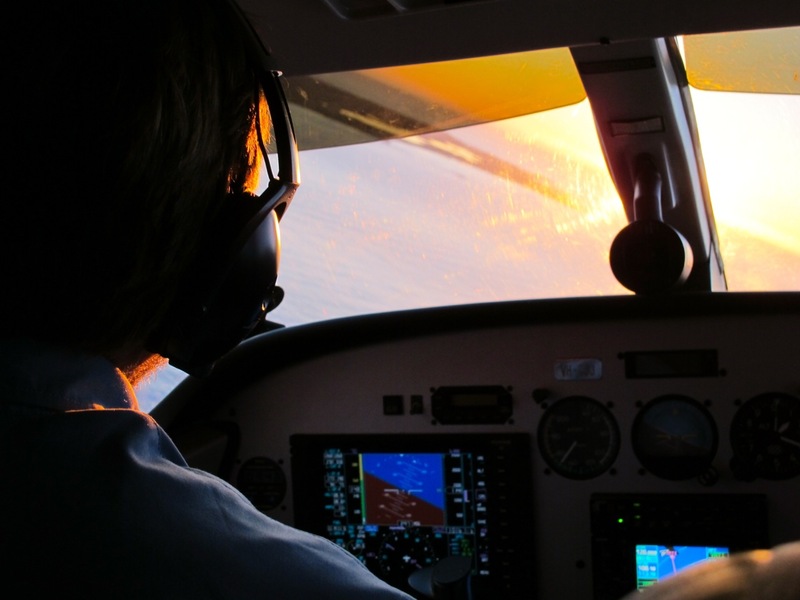 Despite all the fantastic sights, the colours of the setting sun and the shenanigans of all on board, I did find the time to trial a couple of Aviation iPad Apps for pilots. The two involved were AirNav Pro and OzRunways. Both have maps and inflight navigation. On the way there it was OzRunways and AirNav Pro on the return. With my GNS external bluetooth GPS in the front window, the iPad had a good GPS lock throughout the trip. Unfortunately OzRunways dropped the plane off the track and I basically lost where we were. Since it wouldn’t recover, I swapped to AirNav Pro. It immediately located us correctly on the map and showed a 5m error. Although this was a quick test, it got me thinking about how you can’t trust the apps as the sole replacement for navigating with maps. More on these another time. For now, here’s the sunset I captured at Rottnest Island as we climbed out from the airfield, enjoy 🙂 Thanks for the ride Kev. 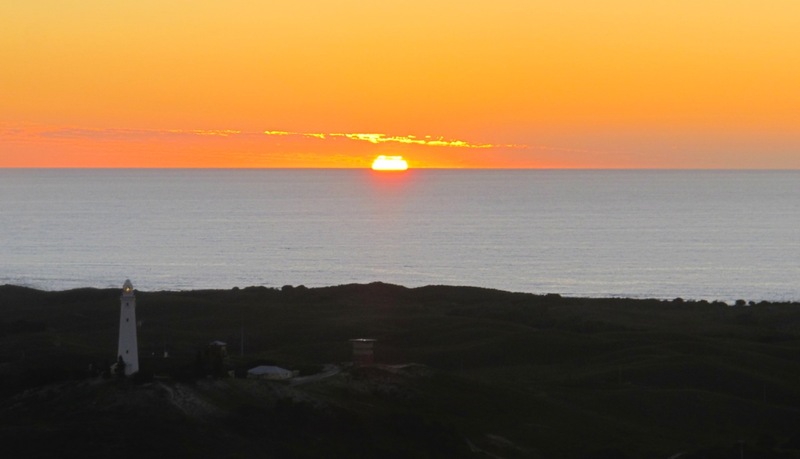 Beautiful Sunset from above Rottnest Island with the Lighthouse in the foreground. 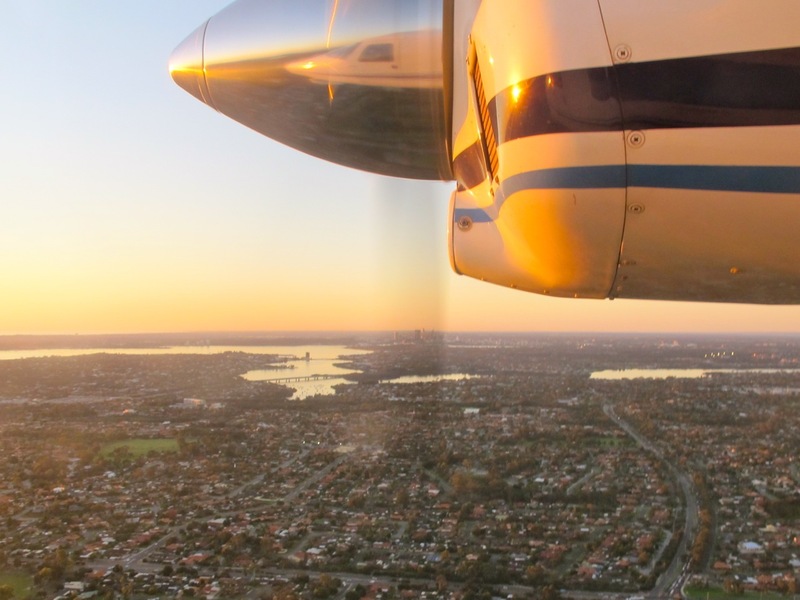 This entry was posted in GPS, iPad, Twin Engine and tagged Flight, P68C, Plane, Rottnest Island, Sunset, Twin Engine, VulcanAir. Bookmark the permalink. The pleasure was mine Birdman. Flight time, including allowance for sledging, mocha application, software evaluations, photography, cinematography, more sledging, a touch and go, asymmetric flight demonstration, a Vx takeoff, a performance of Sledgfest in A minor (that’s A for Avila) followed by a mediocre landing – 24 minutes. Not bad! I can feel a few of those Rotto Blatts coming on.